Once you've decided on a great design for your apparel, each color used in your art is printed separately in black ink onto clear film. Then each "separation" is burned onto a mesh screen using a special coating and a super bright light table. The bright, hot light causes the coating around the black ink on the separation to cure, and the remaining coating is washed away, leaving only your design behind! All the screens are attached to a screen printing machine, with your apparel directly below them. The screens are lowered and colored ink is pushed through the mesh & applied in a thin layer, one color at a time. Last, the apparel is sent through a belt drier at a high temperature, immediately curing the ink! Your shirt is now ready to wear! Benefits: Ink makes for a lightweight, highly detailed image which won't weigh down a t-shirt! 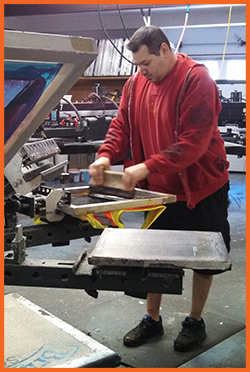 Screenprinting can produce many prints quickly, which means lower pricing on large orders. And ink can be mixed to create ENDLESS color options! After you pick your favorite design, your computer artwork file is "digitized" into a file the embroidery machine can read. A hoop is placed around the spot where your want your artwork to appear, and then attached to the embroidery machine. 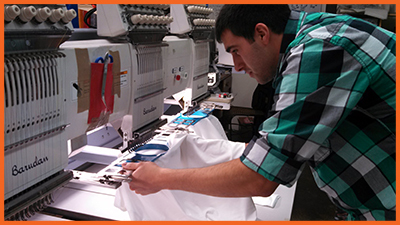 The embroidery machine reads your digitized file & sews the design onto your apparel! We also have pre-digitized clipart, and can create names or numbers on the spot! Benefits: Embroidery creates a professional, long-lasting appearance that can be applied in tight spaces. Plus there are tons of color options and shades available! 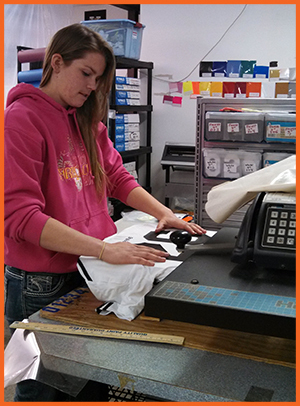 If you need one shirt with a simple design, or individual names and numbers on a jersey, we'll heatpress it. Your digital design or personalization is read in our vinyl cutting program. Then we add a roll of colored vinyl to a vinyl cutting machine. Your design or personalization is cut out and the excess vinyl is "weeded" away. Your shirt is then placed on the heatpressing machine. Once the vinyl is positioned correctly on the apparel, a very hot iron is pressed down for a very seconds, adhering the design to the fabric! Benefits: Your entire team or club can have personalized names or numbers in large type! And if you need only a few shirts, we can add a simple (but cool) design at an affordable price.